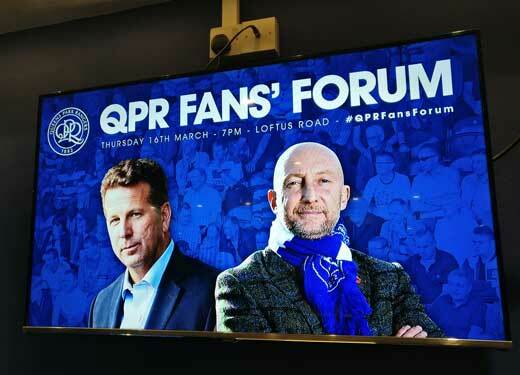 The latest instalment of the QPR fans forum gave us “The Hoos and Holloway Show”, a rib-tickling side-splitting cornucopia of family entertainment that would put Morecambe & Wise to shame. Okay, maybe not… but this was perhaps the most convincing fans forum event staged under the current set of owners. Not only are Lee Hoos and Ian Holloway strong and credible assets on top of their game, but the club is actually getting quite good at holding these events. It was once again held in the W12 / Tony Ingham Suite. This is a room little more than a long corridor and in its own way provides ample and stark evidence of Loftus Road’s inadequacies. Previous fans forums have seen the key protagonists huddled at one end of the suite. Behind a desk, backs to the wall, almost fighting their way out of a corner. Symbolically as well as practically this forum was much different. Hoos and Holloway were sat in front of the narrow expanse of the suite. They perched on elegant barstools while host Paul Morrissey asked the questions. On more than one occasion Ollie looked like a modern-day Des O’Connor breaking into a cosy impromptu duet with his studio guest at his side. Perhaps a less ancient simile would have the pair clutching their microphones and waiting to stand up at the surge of a Westlife-style change of key. 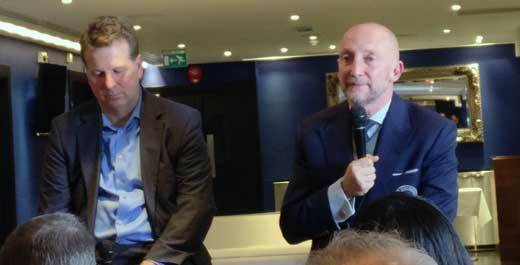 This was about as relaxed as a public audience get to see these two key figures at the club. Holloway turned on his usual chippy Bristolian charm, yarning on with a sincerity unmatched by any other Rangers manager certainly in my memory. Hoos by contrast demonstrated an air of man in charge, aware of the difficult challenges ahead, unfazed by the responsibilities and distractions of ‘driving the van’ (his own metaphor). And the running of the event felt more under control too. Unlike previous evenings there were no prompts to the audience about time limitations. Much of the two hours was taken up with questions submitted previously or handed in by the audience earlier. I was impressed by how Morrissey and the media team chose a mix of questions with a good smattering of on- and off-pitch matters and fan concerns. Nothing was dodged. It is fortunate that the narrative coming out of the club right now is largely positive, with good recent team form and much improved financial results. But even areas of potential controversy, such as the Stan Bowles Benefit Match were dealt with head on. The small number of questions taken from the floor on balance seemed about right given since the club had already aired so much. It also lessened the risk of long-winded rambling ranty questions which have in the past brought this event some infamy from social media. As for the substance? Not that much new and of note was revealed. Ollie predictably talked at length of how important bringing together the group is, and how the scouting team was soon to be boosted by a major appointment (not a well kept secret if you believe social media). He noted how excited fans were about Ravel Morrison, but that the Lazio loanee still has some work to do both on his training and his punctuality. Ollie would do his very best to help him as he has done others. In fact the only past player he said he feels he failed with was Clarke Carlisle. In happier news Kazenga Lua Lua is nearer to fitness than first thought. However Hoos refused to be drawn at all on Stephen Caulker, which he described as a ‘disciplinary situation’. In off-pitch matters it was a similar story. Warren Farm progress is still frustrating but optimistic. Hoos hopes there still might be hopes for Old Oak but it was now looking unlikely, and the Linford Christie stadium opportunity is very much ‘early doors’. It’s still my view that February’s announcement of LCS as an option amounts to an elegant withdrawal from Old Oak as a possibility. Perhaps the only area with any hint of stumble was regarding questions over debt. Most fans acknowledge both the board writing off £180m of debt and the obvious efforts to reduce losses to £11m in the report & accounts to May 2016. But the revelation that Ruben Gnanalingam (now QPR’s majority shareholder) has loaned sums of money to the club at commercial rates of interest raised a number of eyebrows. The rates charged are higher than the 10% APR payable to the infamous ABC Corporation of Panama not that long ago. Hoos was never likely to provide a full and frank rationale for this move when asked, and perhaps we never will know the true reason. But QPR fans with long memories can be rightly nervous about such issues and maybe more reassurance was appropriate. Ollie spoke of how he had full trust in this set of owners and how genuine they are. Maybe this is an area where sentiment needs to rule the day. Overall though, a great evening and one which affirmed the growing confidence on the pitch and the improving trajectory off it. A video of the Fans Forum will be freely available on the QPR YouTube Channel. As ever, our thanks to the club for the invitations.